One of the bigger changes we saw in the jump from Gingerbread/Honeycomb to Ice Cream Sandwich was in the camera app. ICS not only brought a streamlined, more subtle design to an app that so badly needed it, but also introduced zero shutter-lag, meaning the time between pressing the shutter release and capturing a photo was pushed down to (almost) zero. In fact in many cases, the time between touch and capture is imperceptible. This was huge. 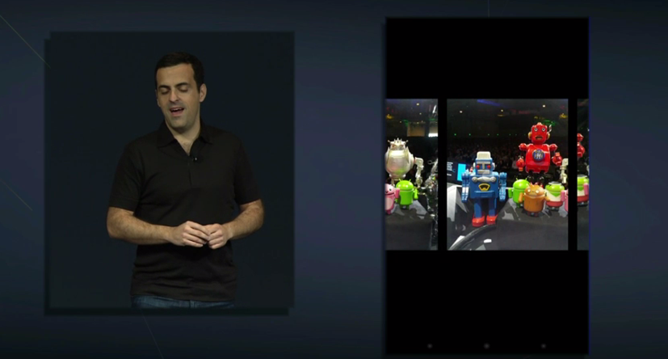 At today's Jelly Bean announcement, however, we learned that Jelly Bean treats users to even more enhancements to the camera app. While they are rather minor tweaks, they enhance the app's productivity and usability by a lot, something that seems to be a common thread in Jelly Bean's enhancements. Perhaps the most notable change is that users can now pinch the screen while in the camera app to reveal a side-by-side view of the camera and gallery photos, allowing for quick(er) access to recently taken photos. While in this view, users can tap to share photos, or simply slide them out of view to delete (don't worry though – this is an undo-able action). While these may sound like minor design/functionality tweaks, they – when taken with today's other revelations – certainly enhance the overall usability and productivity of the app, and by extension, Android as a whole.